Fossil discoveries demonstrate that the existence of chameleons dates back at least 80 million years. To date, there are over 150 identified subspecies of chameleons on our planet. From protruding and independently rotating eyes to curled tails to striking colors and patterns, these fascinating reptiles draw the admiring attention of zoo guests across the nation. To view any chameleons in the wild, hopping a flight to Africa will grant the best opportunity for observation. More than half of the chameleon species are indigenous to the island of Madagascar, off of Africa’s east coast. Numerous other species take up residence in the sub-Saharan region of eastern Africa’s savanna. Some of these African countries include northern Mozambique, Kenya and Tanzania. Although chameleons have been introduced into Hawaii and Florida, there are no known species of chameleons native to the North or South American continents. Asian chameleons can be found in southern India and in Sri Lanka, and European chameleons reside in the Middle East’s Arabian peninsula and in southern Spain and Portugal. The habitat requirements for chameleons vary between species. Most of the chameleons of Madagascar require the temperate climate of the rain forest, spending much of their time perched in the trees. Other chameleons establish their homes among the bushes and trees in Africa’s open scrub land. 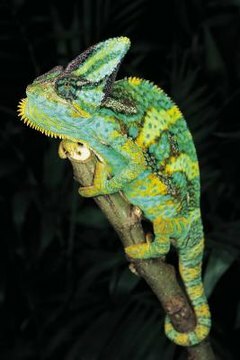 The word chameleon is derived from the Greek words “chamai,” meaning ground or earth, and “leon,” meaning lion. Some species of chameleons live up to the notion of living on the ground, rather than up in the trees. The Namaque chameleon burrows into the sandy dunes of Africa’s arid Namib Desert to maintain his cold-blooded body’s natural temperature. The horned leaf chameleon can be found at home among fallen leaves and twigs on the forest grounds. The sail fin chameleon prefers the cooler, moist atmosphere of Africa’s montane forest region. Most chameleons are extremely territorial and prefer to live in solitude. They join together only during mating season, during which time competing males become particularly combative. Despite the popular myth, chameleons do not change color to camouflage themselves with their surroundings as a protective measure against predators. Chameleons actually choose home surroundings that closely match their natural colors. A chameleon who normally appears bright green will opt for residence among the green forest leaves. The color changes, as with those of a mood ring, are a means of communication, conveying moods that range from warning others off of their territory to welcoming potential mates. Color changes also work with their environment to regulate body temperature. In a hot climate, lighter color variations attract less heat from the sun, while in cooler areas, darkened colors draw in more heat. While only a few chameleons face an immediate threat of extinction, the overall chameleon population is suffering from eviction from their homes. As man develops land, deforestation, logging and agricultural practices have encroached on the chameleon’s homeland, leading to a decline in their numbers. In addition to habitat loss, a steadily rising intrigue with owning exotic animals has increased the pet trade, seizing chameleons from their native habitats for export to exotic pet retailers. Sadly, many of these chameleons do not survive due to the lack of their precise climate needs that only their home continent of Africa can provide naturally.